The Email purports to come from Microsoft Corporation and claims that all email users across the world are requested to validate their account information by clicking a link in the message and threatening to delete your account from the email server unless you have validated the account. 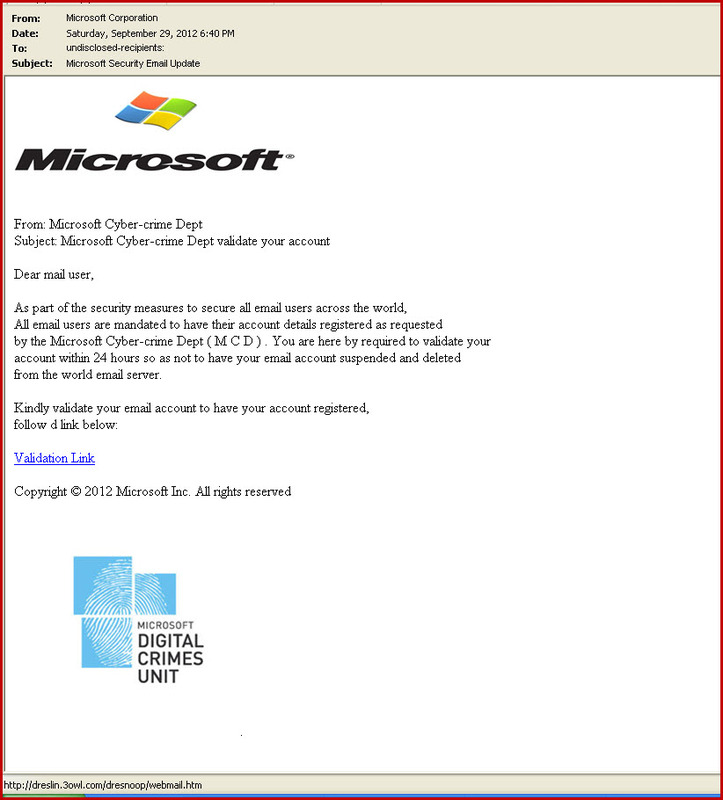 The email appears complete genuine with official Microsoft Digital Crimes Unit logo, and recipients are instructed to click a link in the message in order to register and validate their email account. However, the email is a phishing scam. It is certainly not from Microsoft.The Microsoft Cyber-crime Dept is real, but its name and logo have been stolen and misused in this scam message only to make the scammer’s claims seem a little more plausible. The link in email will be taken to a bogus website and asked to log in to their email account by supplying an email address, username and password. So that the account credential will be grabbed by the criminals who responsible for this phishing attack. Once they have collected the submitted information, the criminals can further use it to hijack the compromised email accounts and use them to steal further information and send out more scam and spam emails to the people in the account’s address book. Any emails sent from such compromised accounts will appear to have been sent by the account owners rather than by the hijackers. Request you to supply personal information directly into the e-mail or submit via website. Threatens to suspend or close your online accounts if you do not respond for the email. Claims that your account has been compromised or accessed by unauthorized person. Requests you to enter, validate or verify your account information. States that there are unauthorized charges on your account and requests your account information. Claims that the bank has lost important security information and needs you to update your information online. Requires you to enter your card number, password, user ID or account numbers into an email. Protect yourself from email frauds. Never click on Hyperlinks within emails, instead, copy and paste them into your browser. Always look for “https://” and padlock on web sites that require personal information. If you didn’t initiate a transaction to which an email is referring, it’s probably a scam. Omniquad Mailwall Remote detected it as phishing and has been blocked it from their customers. P.S Please tweet or share on Facebook to warn others about this scam. Have you received a phone call or an email claiming to be from Microsoft? Tell us about it! M. and you are advice to reconfirm your contact details. will rich you on how to receive your contract inheritance fund payment. You are advice to contact me on this email: federalministryoffinance820@yahoo. Thanks for your understanding as we await your urgent response in this. Hi, thanks for sharing this brilliant example of an email scam with us!